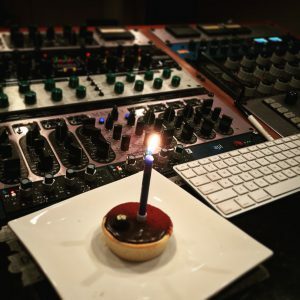 On April 23, Deluxe Mastering celebrated 10 years since opening its doors. Our sincere thanks all clients who’ve helped make it happen. 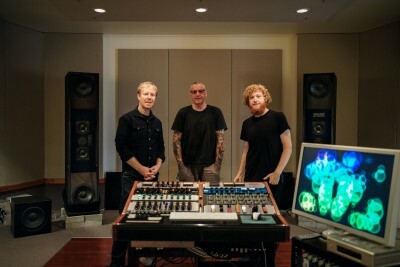 Marking the Deluxe Mastering studios’ 10 year anniversary: Adam Dempsey, Tony “Jack the Bear” Mantz and Andrei Eremin. Jack the Bear recently mastered EPs for You Am I (for digital and vinyl release), Eat The Damn Orange, Them Bruins, singles for Lama (produced by Jonathan Dreyfus), El Colosso (mixed by Jez Giddings at Hothouse), Smoke Stack Rhino, US act Street Rock Mafia, and new album for Daniel Tooze. Music workshops have been held to support new artists, inspirational videos are now on his new You Tube channel, along with a new video podcast series “Melbourne UNreal”. In May, Adam Dempsey marked 30 years in audio and 21 years of mastering professionally “with more thanks than I can verbalise, to all who create the music and generate the goosebumps in the first place”. Recent projects include releases for Alex Watts (mixed by Jez Giddings), Andy McGarvie (mixed by Sam Lowe), Big Smoke (7 inch vinyl for Record Store Day), The Earthmen, Frida, In Capital, Justin Yap Band, On Diamond (Lisa Salvo and band), Masco Sound System (vinyl), The Sand Dollars, The Settlement, Slim Dime (produced by Matt Walker), and Tetrahedra. Sincere condolences to family and friends of Adrian Slattery of Big Smoke, who tragically passed away in May from cancer. 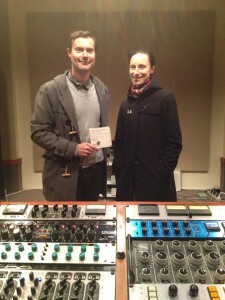 Adam Dempsey marked 21 years of mastering professionally. Andrei Eremin has found himself mastering releases for Sticky Fingers, Cleopold, Tiny Little Houses, GL, Foreign/National, Anatole, Ara Koufax, Rainbow Chan, Audego, Brightly, Darts, Buoy and Alba, as well as many debut releases for new artists. Tony “Jack the Bear” Mantz has been polishing off new projects for L.A production team 4e, Cairo Knife Fight, Pretty City, Super Zero Monkey, Jim Keays (R.I.P. ), The Neighbourhood (now sold 2 million copies), Contagious, Clockwork, Dead Bear, Head Clouds, House of Honeys, Sunset Blush, and Lemonberry. Adam Dempsey has been editing and mastering a live album from Xavier Rudd (mixed at Sing Sing by Simon Keet), and mastering releases from La Rumba, Jack On Fire, the long-awaited sophomore second album from post-rock instrumental trio The Boats, Bronwyn Rose, Freedom (formerly the Merri Creek Pickers), The Perfections, Damon Smith, Matt Glass, Dear Plastic, Big Smoke, Noah Earp, Smiles.Rifles, Tinsmoke and a Philemon/ZedEppelin remix. Andrei Eremin broke out the resident Ampex ATR-102 for transfer of an experimental 2-track vinyl by Melbourne electronic act I’lls. The standard polish was given to new music from Oscar Key Sung & Guerre, Leisure Suite, SMILE, Lower Spectrum, JP Klipspringer, Naminé, Martin King and Telling, as well as remixes and promos from regulars Rat & Co and Milwaukee Banks. Tony “Jack the Bear” Mantz has been keeping out of mischief mastering releases for Ash Grunwald (featuring Scott & Andy from The Living End), Amba Shepherd, Red Remedy, Lakoda Burn, Lester the Fierce, Chris Arnott, Dave Winnel, Jimi Frew, Anthony Young, tyDi, Siren Sun, Nicholas Futcher and continuing to raise money for charity through the monthly Jack the Bear Foundation mastering drives. Adam Dempsey has mastered new releases for Les Thomas (mixed by Neil Thomason and Jeff Lang), The Orbweavers, Halcyon Drive, Hoodlem, Kate Rae (mixed by Roger Bergodaz), Rad Navajo, The General Assembly, Vague Cuts (tracked and mixed by Jez Giddings at Hothouse), and a 7 inch single for Jack On Fire. Andrei Eremin mastered tracks for Oscar Key Sung, Sons et al., Milwaukee Banks, Banoffee, Naomi Keyte, Onix, Klipspringer, Sirens, Shunya, and given the all clear for production of the Rat & Co debut album on French-pressed vinyl. We thought we’d recap on a diverse array of recent mastering projects, as many of us hit the ground running again this year. No Top 10, 50 or 100 of 2012 here. (Like that would be possible anyway). Tony “Jack The Bear” Mantz has mastered releases for Eddie Bravo, The Big City, Captcha, Peking Duk, Electro Mafia, Waking Eden, Ben Caruso, DJ Rubz & Sherlock, Rattlin Cain, Anna Johnson and finishing off Dirty Three’s Mick Turner’s solo album. He has also started The Jack the Bear Foundation, offering mastering for a donation one day a month, with 100% of proceeds in aid of various charities. Getting the analogue mastering treatment with Adam Dempsey: an album for vinyl release from Matt Bailey (The Paradise Motel) produced by Brent Punshon at Head Gap, two albums for acclaimed jazz saxophonist and clarinetist Adam Simmons’ Origami trio engineered and mixed by Myles Mumford, also The Pierce Brothers engineered and mixed by Fraser Montgomery at The Aviary, The String Contingent, and Melbourne funk/soul artist and producer Dru Chen. Andrei “Ony” Eremin mastered releases for The Honey Badgers, Brightly, Rat & Co and House of Laurence. Best wishes to all of our valued clients for a healthy, happy and musically abundant year ahead.